Our first luxury cruise experience. 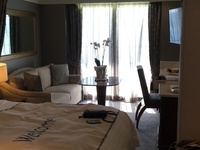 Came well recommended, and after much research decided this would be good value for a luxury xperience. Even after all that research we were not prepared for the level of service, such a carefree 10 days, surrounded by sunshine and smiling faces (crew and passengers alike). Excellent food experiences, though surprisingly slightly disappointed in Prime 7, but Chartreuse was a wonderful experience. Compass Rose, beautiful, and always delicious, . From breakfast to lunch to Teatime, to cocktails,to dinner, we were spoiled in every way. Our suite was lovely, spacious, and comfortable in every way. Very comfy chairs on the balcony. Ours was the lowest category cabin, but it did not feel like it, the bed was heaven, and it was kept spotless by our by our 2 very sweet attendants, as well as keeping us well stocked with champagne, and anything else we wanted. The fresh fruit in the room was of the best quality. The included excursions were also very good. We picked this itinerary to have a relaxing, luxury experience, and we were very happy, and would definitely consider more cruises with Regent. 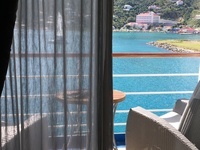 Our first luxury cruise experience. 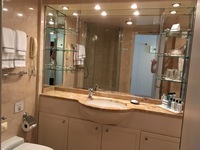 Came well recommended, and after much research decided this would be good value for a luxury xperience. Even after all that research we were not prepared for the level of service, such a carefree 10 days, surrounded by sunshine and smiling faces (crew and passengers alike). Excellent food experiences, though surprisingly slightly disappointed in Prime 7, but Chartreuse was a wonderful experience. Compass Rose, beautiful, and always delicious, . From breakfast to lunch to Teatime, to cocktails,to dinner, we were spoiled in every way. Our suite was lovely, spacious, and comfortable in every way. Very comfy chairs on the balcony. Ours was the lowest category cabin, but it did not feel like it, the bed was heaven, and it was kept spotless by our by our 2 very sweet attendants, as well as keeping us well stocked with champagne, and anything else we wanted. The fresh fruit in the room was of the best quality. The included excursions were also very good. We picked this itinerary to have a relaxing, luxury experience, and we were very happy, and would definitely consider more cruises with Regent. Lovely, bright, comfortable. 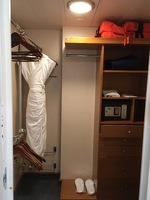 Great walkin closet, bathroom with shower and tub, and lots of space for toiletries.. Loved the balcony, I guess it could have had a little more room to get around the table and chairs, but certainly not a major problem. Loved every minute we spent in it, would have spent more if the other spaces onboard were not equally appealing. First time up on a paddleboard. Getting up was the hard part, once up very enjoyable. Long awaited trip to the Baths. Beautiful and fun experience, would love to do it again. Good cruise experience but not great.